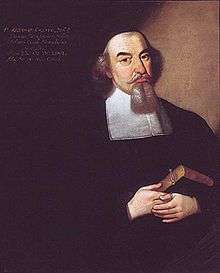 Abraham Calovius (also Abraham Calov or Abraham Kalau; 16 April 1612 – 25 February 1686) was a Lutheran theologian, and was one of the champions of Lutheran orthodoxy in the 17th century. He was born in Mohrungen (Morąg, Poland) in the Duchy of Prussia. After studying at Königsberg, in 1650 he was appointed professor of theology at Wittenberg, where he afterwards became general superintendent and primarius. Title page of the Calov Bible, with Bach's signature in the bottom right hand corner. Calovius opposed the Catholics, Calvinists and Socinians, and in particular attacked the syncretism of his bitter enemy, George Calixtus. While Calixtus affirmed that the Apostles' Creed was an adequate definition of faith, Calovius rather held that one must believe every part of revealed truth in order to gain salvation. This led Calovius to deny as a heresy the idea that Roman Catholics or Calvinists could be partakers of salvation. As a writer of polemics Calovius had few equals. His chief dogmatic work, Systema Iocorum theologicorum, (12 volumes, 1655–1677) represents the climax of Lutheran scholasticism. He produced a popular commentary on Martin Luther's translation of the Bible, "die deutsche Bibel," today known as the Calov Bible. He also wrote a much larger professional exegetical work on the entire Bible called "Biblia Illustrata." It is written from the point of view of a very strict belief in inspiration, his object being to refute the statements made by Hugo Grotius in his Commentaries. 1 2 3 One or more of the preceding sentences incorporates text from a publication now in the public domain: Chisholm, Hugh, ed. (1911). "Calovius, Abraham". Encyclopædia Britannica. 5 (11th ed.). Cambridge University Press. p. 68. Wikimedia Commons has media related to Abraham Calov.